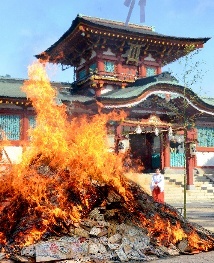 The Kitsune (Fox) Fire Festival in Hida, Gifu. 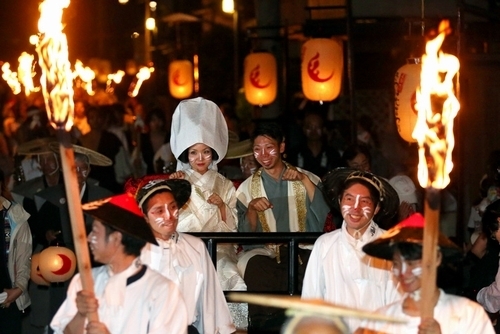 Participants have white whiskers and red noses painted on their faces, and about 70 people bearing torches join the wedding procession for the foxes. Here’s the English-language explanation provided by Gifu. NOW HERE’S AN EXAMPLE of thinking outside the envelope. The Aquatotto fresh water aquarium in Kakamigahara, Gifu Prefecture, has set up a Christmas tree in their first floor lobby with lights powered by the discharge of an electric eel. The tree will be up until Christmas day. Electric eels—which are more closely related to catfish than eels–discharge electricity when locating their prey or defending themselves. The specimen in the aquarium generates the juice when it’s been fed. 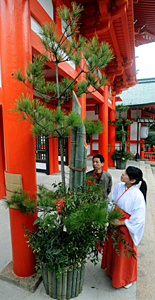 The keepers have placed electrodes in the tank that detect and amplify the electricity to light up the two-meter-high tree. The lights on that tree burn more brightly than one might suspect. 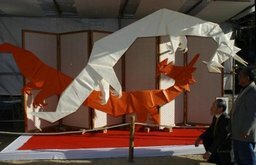 The fish can grow from one to 2.5 meters long and weigh up to 20 kilograms. They also can generate up to 500 volts and 1 ampere of current (500 watts), and can be dangerous for adult humans. 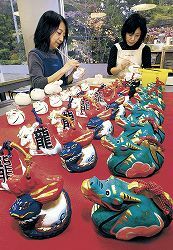 Leave it to the Japanese to think of a way to use fish to make spirits bright during the holiday season! 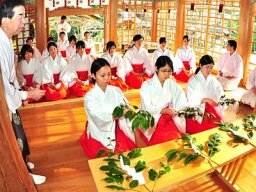 THE WEATHER’S TURNED NIPPY IN JAPAN, and for a nip to ward off fall’s chill, many Japanese turn to a type of sake called doburoku (or nigorizake, explained here). 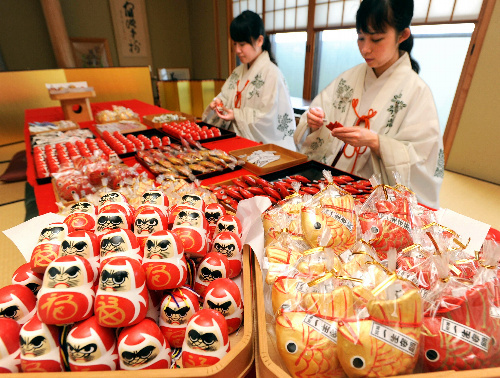 And this time of year, where do people go for a taste of some divinely inspired doburoku? 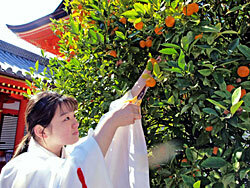 To a Shinto shrine, of course! 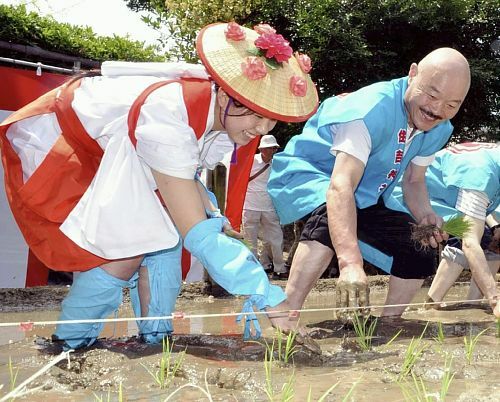 This isn’t like the Catholic church, where only the priests get to surreptitiously sip the sacramental wine behind the sanctuary—in Japan they ladle it out for all the parishioners who show up for the services. 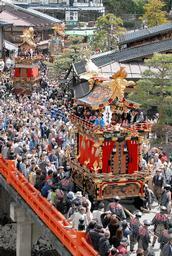 One of the most well-known of the doburoku festivals was held at the Shirakawa Hachiman shrine in Shirakawa-mura, Gifu Prefecture, on 14 and 15 October (first photo). 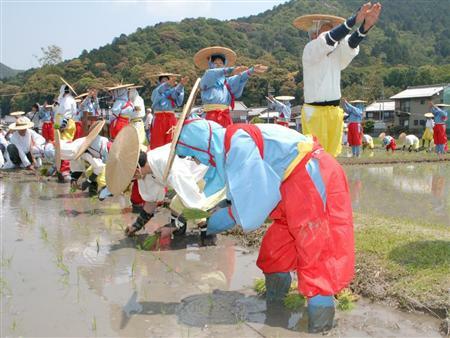 The ceremony is held every fall to give thanks for a bountiful harvest, and it’s so well known that 15,000 people showed up on the first day. 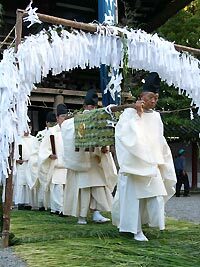 The shrine’s doburoku has been made from a combination of locally produced grains for about 1,300 years, making this one very well-established tradition in a country known for them. 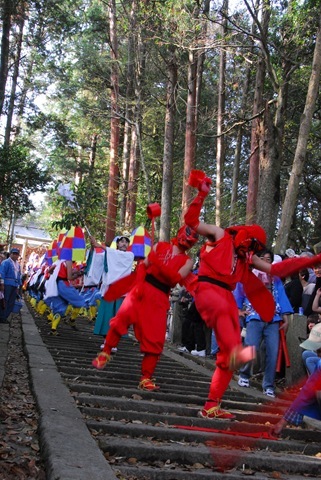 The shrine authorities are considerate enough to provide entertainment for their visitors, too; a traditional lion dance (shishimai) is held in the village in the morning of the 14th, before they tap the kegs. 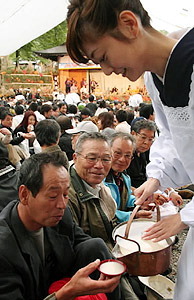 Local women dispense the cloudy sake to the shrinegoers, who sit on straw mats on the shrine grounds, watch traditional Japanese folk music performed on a temporary stage set up on the grounds, and enjoy the fall weather. 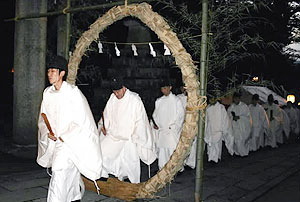 In fact, the people of Shirakawa enjoy doburoku so much, two other shrines in the village have their own festivals in quick succession—one is held right after the Hachiman shrine’s event on the 16th and 17th, and the other immediately after that on the 18th and 19th. 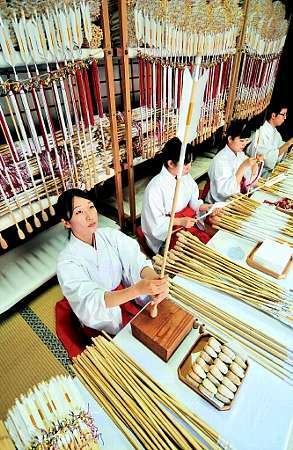 There’s no off-premises drinking, but the people who buy a red lacquer sake cup get unlimited refills. By this point, you might well be wondering if all this holy rolling in the gutter doesn’t create some dicey conditions for those driving home. 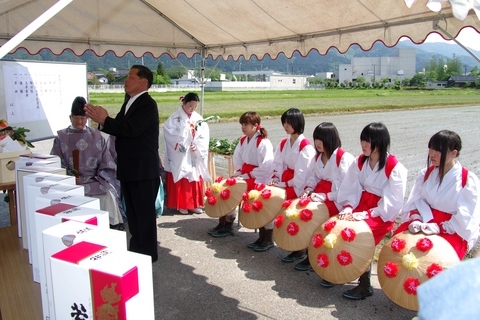 Well, that occurred to the shrines too, especially considering that drunk driving has been an issue of growing concern in Japan over the past couple of years. 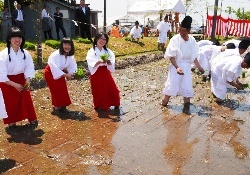 That’s why the organizers of the doburoku festival held at the Shirahige Tahara shrine further down the archipelago in Kitsuki, Oita Prefecture, on 17 and 18 October (second photo) took the initiative to discuss the matter with local police. 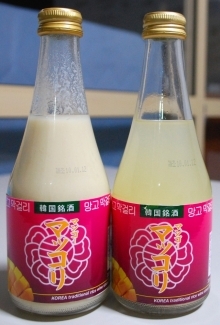 The talks resulted in two policy changes. 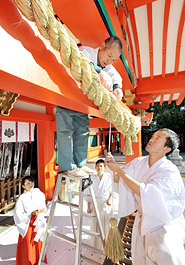 First, shrine visitors are now able to take home the divine brew without drinking it on the premises. 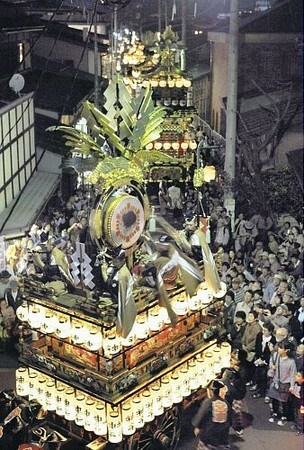 Second, police set up inspection stations near the shrine to catch anyone in their cups while in the car. 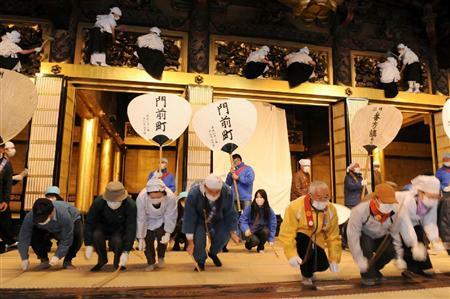 Shrine officials were concerned these stringent measures might depress attendance at their festival, which will celebrate its 1,300th anniversary in 2010. 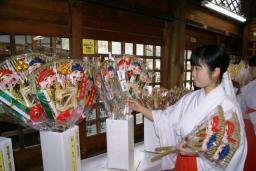 To their delight, those concerns proved to be unfounded, as the number of visitors exceeded last year’s total of 18,000. (Yes, that’s a lot of people, but consider how many folks would show up at St. Elmo’s if they gave out goblets of wine.) 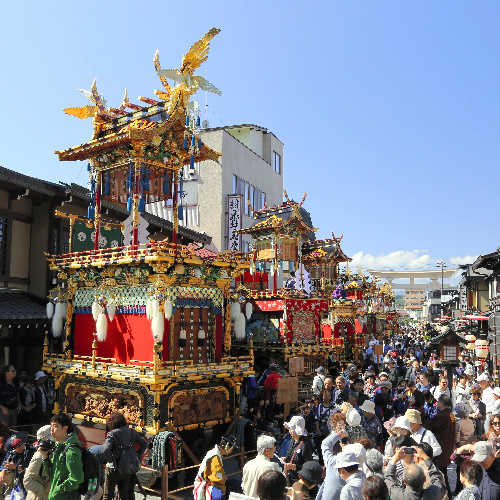 The shrine also had to deal with about 2,100 vehicles, an increase from 1,600 the year before. But one 46-year-old man interviewed by the local newspaper had his own solution—he brought along his wife so she could drive him home! 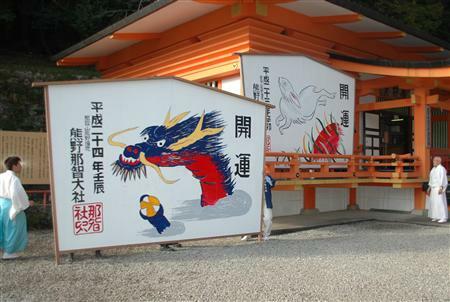 There are about 10 Shinto shrines in Japan with the legal authorization to brew doburoku, and only one of them is on Shikoku, the smallest of the four main islands. 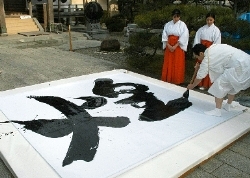 That distinction belongs to the Uga shrine in Mitoyo, Kagawa Prefecture. 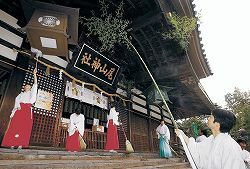 There’s a good reason they were selected–the shrine has two guardian deities: one for food, and one for sake brewing. 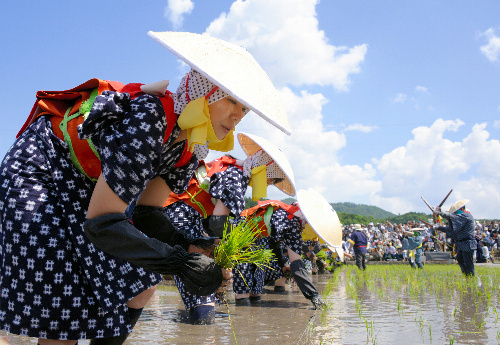 And the two deities are all the more reason for doubling their fun, so they have two doburoku festivals—one in the spring to pray for a bountiful harvest, and one in the fall to give thanks for the harvest. 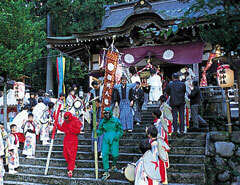 The fall festival is held on 20 and 21 October. 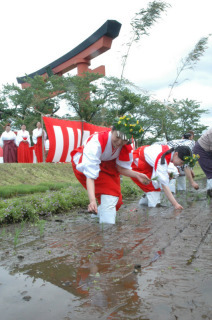 Just before that, however, on the 18th, they held the Kuchiakeshiki, which literally means “mouth open ceremony”. That’s an expression used to denote the beginning of an event, such as a special sale, but you’ll have to admit it’s also particularly apt for a party to down doburoku. 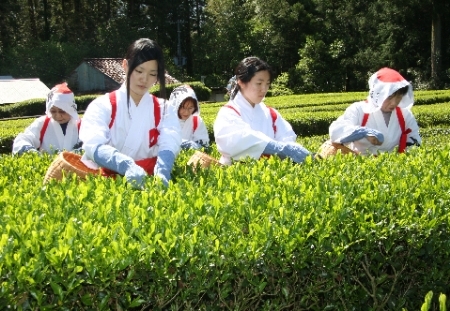 The Kuchiakeshiki is held to test palatability and sweetness. (Doburoku tends to be very sweet.) 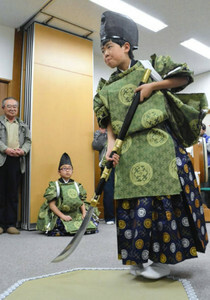 The third photo was taken during that ceremony. 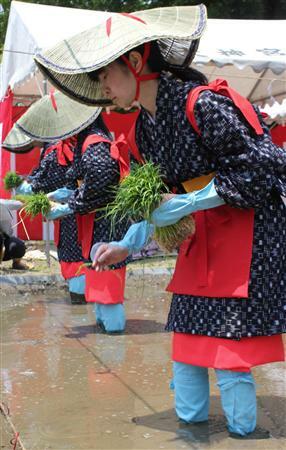 Brewing started at the end of September with newly harvested local rice and well water taken from the shrine grounds. 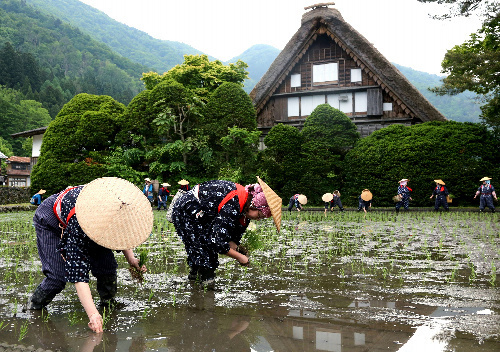 The parishioners donned eboshi hats and white robes to grind the rice grains with a stone pestle, and produced roughly 280 liters. 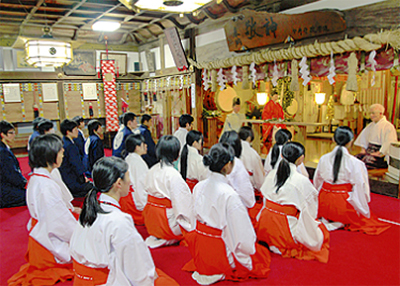 Fifty people attended the Kuchiakeshiki. 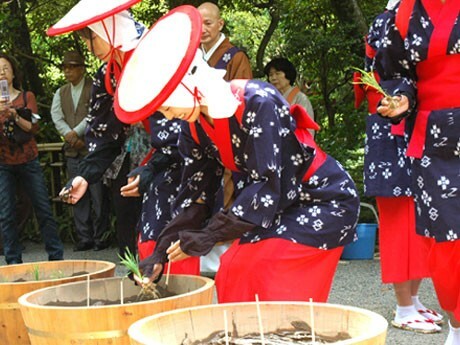 No fools they–after offering the new sake to the divinities, they tried it out themselves. Reports indicate they were pleased with both the palatability and the sweetness, and one of the brewmeisters said it had been a good idea to start brewing just when the weather turned cold. 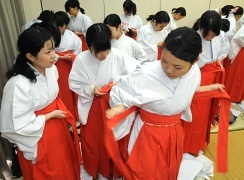 The doburoku was passed out from 3:00 to 9:00 p.m. on the 20th, and on the morning of the 21st. We hope none of the recipients passed out later. 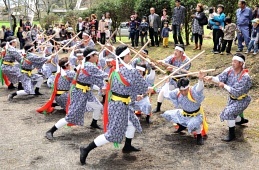 They would have missed out on the entertainment—in addition to a lion dance and a taiko drum performance offered on the night of the 20th, visitors were also served local cuisine. Doesn’t this sound like a great way to spend some time at a religious institution? 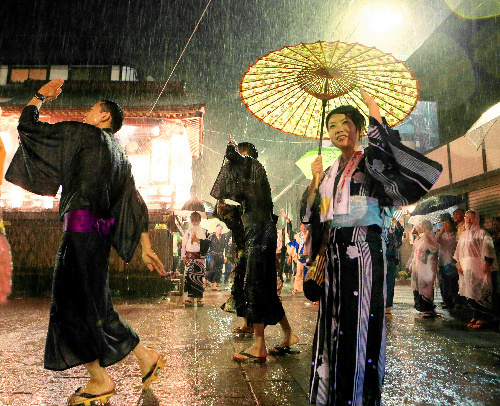 And here’s the best part—you don’t have to convert to Shinto. You just show up at the shrine!